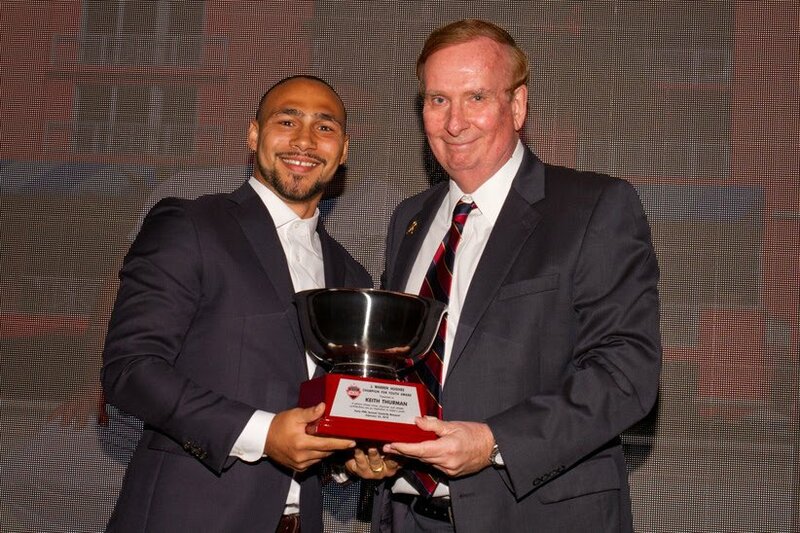 Keith Thurman, the current unified WBA and WBC Welterweight World Champion, received the thirty-third annual “Champion for Youth” award by the Clearwater for Youth organization this past Saturday. Thurman was presented the award for his “virtue, character and athletic contributions” for the area’s youth. He joins past “Champion for Youth” recipients Steve Spurrier, Tommy LaSorda, Larry Bird, Joe Maddon, the late Roy Halladay and others. Thurman was presented the “J. Warren Hughes Champion for Youth” award by Brian Aungst Sr., former Mayor of Clearwater and Chairman of the Board for Clearwater for Youth. Also receiving awards that night were Spurrier for the “Outstanding Achievement in Sports” award and local businessman John Thomas receiving the Humanitarian award. The organization also presented 12 scholarships that night at the 45th annual awards. Shown with his award, Keith Thurman, Jr. and Brian Aungst Sr. Former Mayor of Clearwater and Chairman of the Board for Clearwater For Youth.